The Wii and DS systems suffered from extensive hacking and unauthorised mods, which allowed people to create their own apps and, alternatively, download and use ROMS of games for free. The homebrew scene was one aspect, though accompanying piracy was a substantial problem that impacted software sales and has been the source of litigation efforts from Nintendo around the world. To date the 3DS and Wii U have remained relatively secure, with potential workarounds on the portable struggling to make progress and Nintendo remaining active in shutting down any security weakness through regular system updates. 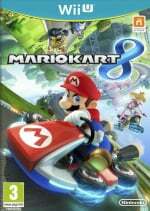 The Wii U, at more than 18 months old, has also been largely unaffected, though YouTube channel MrBean35000vr claims to have streamed and now uploaded footage of it utilising a browser-based exploit to modify and change code in Mario Kart 8, and to also tweak fonts in the main Wii U operating system. 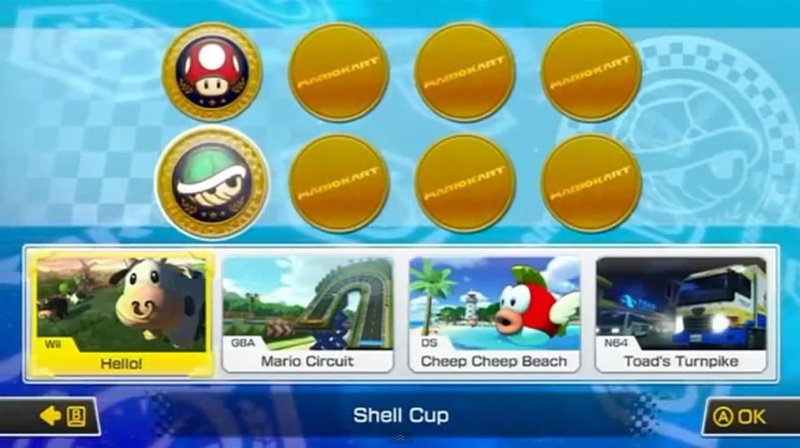 Beginning with claims that they're fully in control of a Wii U, the Mario Kart 8 demonstrations involve mixing up music files to play quickly from the beginning and fall to silence; we're then shown track names getting changed. After that the fonts on the Wii U system menu and the WaraWara Plaza are changed. At the close of the video the hackers claim that as well as being in the early stages, they will not release their exploit in any way to support piracy, also promising an opposition to 'cheaters' — it is emphasized that it simply wants to work towards producing and releasing "custom tracks, custom songs, you name it"; that, of course, can also be debated on moral grounds. It looks like legitimate footage, though if accurate still raises questions, as the account in use does not seem to have a Nintendo Network ID and it's unclear which version of the system firmware is installed. If it is the latest system version, we suspect Nintendo may target this apparent browser-based exploit in future updates. It is anyone's guess whether this is a legitimate move towards a homebrew scene such as that seen on the Wii. You can see the demonstration for yourselves below. As always, we invite discussion and debate on the topic, but please focus solely on the example in this article and observe our Community Rules. Please also note that there is some bad language in this video. Thanks to DespyCL for the tip. God this guy's voice is so annoying i couldn't even finish watching the whole video cause of it. I can sum up console hacking in 3 sentences really. Homebrew=good. Online cheating=bad. Piracy=bad. Game "mods" always lead to exploits that leads to hardware/system-wide hacking that leads to pirating games. I don't like this. @midnafanboy I Agree, it's very annoying. This hack doesn't support 5.0.0, which is good for now. "when they added the quick boot menu in 5.0.0, it moved a bunch of code around and broke our ROP (Return Oriented Programming) chain that allows us to gain code execution"
" Well, as mentioned before, this doesn't work on 5.0.0 since they changed stuff up on us, so first we'd need to port it to 5.0.0, and then our main priority is to start disassembling and looking for an exploit in the kernel which will allow us to do a lot more and allow for homebrew. As for a timeline for when this will happen, probably not anytime soon, since unless we get really lucky, it's gonna take a while to find the addresses for 5.0.0 blind and then finding an exploit in the kernel will probably be even harder, partially because it's a compiled binary and we have to go through the basic assembly which doubles and triples the work versus if we had the source." Nintendo Needs those updates to keep coming before they manage to make anything serious. Not long till nintendo patches all these kids's work. I can't stand how console modders are demonized so much because actual pirates steal their code. If you want to demonize people, look at the online cheaters and pirates. These modders only intend to make custom tracks and whatnot. @WiiUExposed I personally enjoy mods. But they're usually the ones who starts these things and so potential "bad guys" steps in because of it. @ScorpionMG I been playing too much watch dogs cause i thought all hacker's voices are deep and awesome not annoying.Just like aiden voice from watch dogs lol. But in all seriousness nintendo is going to do something about this, they have too now. I think uses like this are okay personally, but unfortunately this backdoor will allow hackers and pirates with not so good intentions to make use of the exploit and cause Nintendo to lose a massive amount of profits. I think in situations like this where piracy isn't intended by the hacker they should just have their exploit patched and not pay a fine or face criminal charges, but those who release emulators that use roms should be fined and face criminal charges since they would seriously effect Nintendo's profits, however emulators that can force a Wii U to read legit disc-based games wouldn't fall under the same category since they wouldn't be affecting Nintendo's bottom-line. Overall I think the hacker's intentions aren't bad so he shouldn't be punished, but if this isn't fixed stat it could blossom into a serious piracy issue. End rant! @SamirMalik Yeah. But the Wii was exploited way before Project M.
This is why I want a vote kick system. MK Wii was unplayable sometimes due to the hackers. I personally enjoy the benefits of having a modded Wii- as a collector I don't have to risk scratching my discs. I can rip to external HDD and play digitally. But I understand there's no way to enjoy modded systems without piracy. I'd rather have no mod benefits and no piracy, than to enjoy mod benefits at the cost of piracy. Small sacrifice for the greater good. If I found a way to hack the system, I would never tell anyone. Cause you already know it would be abused. You can't stop it. People dont seem to get it. The guy who made the video is full against piracy and cheating. Of course, you just go "hurrr durrr ban teh hackers"
@Zyph That depends. See team twiizers. They havent released any of their exploits publicly because of pirates. But of course, when other real hackers/cheaters come to make their own explits, they will ruin the good guys image. I'm in the boat where I think Nintendo should lock anyone systems that have been tampered with. I don't care if not all hackers are pirates, Nintendo doesn't have the time or shouldn't devote the resources to differentiate between everybody. Mario Kart Wii online quickly became f-ing ridiculous because of hackers. I don't like where this is going. Of course, this "hack" is mostly useless since a WiiU without online functions is largely useless, but some folks will abuse it nonetheless. And in all honesty, console game are not supposed to be modded, and modders should accept that. I can see the appeal of mods, but forcing them always leaves a bad taste. @Gridatttack Team Twiizers didn't have much to do with piracy options to begin with. Their methods were always the base for installing the Homebrew Channel or running Hombrew. But that very Homebrew platform served as the opening for pirates. MrBean35000vr really wants to hack the Wii U mostly for MK8 to have things like custom tracks/music/skins change the item system he isn't interested in piracy like some of you are getting at I hope he accomplishes his goal so that he will shut up with his MK8 complaining. I might be wrong but hackers probably won't make homebrew for Wii U anytime soon because of it's small install base, it's just too much work, and even if they did, do you believe pirates will want to download 25 GB games from the internet? Would you risk softmod for your Wii U when permanent bricking is a real possibility? There are no tools to dump and backup your system memory so far, it's one way road, if anything goes wrong, there is no way to unbrick... It's not such big deal if you brick old Wii bought seconhand for 50 bucks, but would you risk your 300 euro Wii U? Most people won't. @Kaze_Memaryu Yes, it was like that on the wii. But im sure these guys wont be making any app that runs homebrew stuff. On one hand I like where this could go in the event of SSB4 not playing well we could have another project M but I really don't want cheaters online in MK8 or SSB4 I know MrBean35000vr thinks this can be controlled but to me that's a fools dream. @ThomasBW84 The Wii U used has never been connected to the internet and had no NNID, MrBean35000vr confirmed this in the videos comment section. Definitely seems like something they did/wanted to try to do just for fun. Somebody make a homebrew that fixes MK8. Piracy is a non issue. It's a boogeyman in a closet. 1. It's been proven that -most- people will get games the legitimate way if given the opportunity. 2. For everyone that 1 doesn't cover, the rest would never pay for it to start with. For example, I only buy EA games used because I disagree with their values. They haven't seen a penny from me in years. If the game used market(or piracy) goes away, I'll just do without. Millions of addtional revenue from this group just isn't going to happen. Ugh, I hope the hacking doesn't get too far as it'll ruin the online for many games like Mario Kart and Smash. Honestly, I know people would want to "fix" some games, but in the end hacking usually leads to piracy. I love Bean's Mario Kart Wii mod, CTGP Revolution. Can't wait to see if MK8 hacking goes any farther. Kenny Loggins Kart 8 is a possibility for the future of the world. I have hacked the wii and ds and only reason is for free games and no discs and I personally don't think purpose is to cheat. Let's not pretend we don't know the end of that particular tune ... please god no. I guess it's too much to ask to just friggin' play a game and enjoy the console. Wii U doesn't need homebrew. it is very easy now to become an offical developer and most of the Wii homebrew was really terrible anyway. @Kewlan I didn't see the full video, I just skipped to the part with the sped up music, and I definitely agree with you. They couls have easily faked this hack. They would just have to record the fast music, and then play their voices at norrmal speed overlaping the music. Very simple to fake, but again I was too lazy to watch these guys get hyped over nothing. Correct me if I am wrong, but me it looks like they faked it. come on though the only real reason people use flash cards such as R4 and homebrew channel is to get retail games for free! they say they don't use it for those purposes but really!? Even though they have good intentions, other people won't have the same mind set. Once they release the Homebrew software (if they ever do), I guarantee you that someone is going to get their hands on the program and modify it to be able to play games with cheats (including online matches) and ways to pirate games. Same thing happened to the Wii Homebrew Channel. They also had good intentions, but others turned it into what it is today. I'm sorry, but I don't support this. Hopefully Nintendo can find a way to stop this from ever being released to the public. I hadn't logged a whole lot of online hours on MK Wii, so excuse my ignorance, but how did modders/cheaters sully the online experience? I applaud the efforts of those who have the ingenuity of creating things like Homebrew and finding exploits, but I am with everyone who says it sets a bad precedent for the wrong people to do bad things, so I hope this doesn't exploit doesn't get very far. I have the homebrew channel on both my Wii and Wii U (Wii mode) but to execute homebrews. GUYS, like it or not, piracy is what made the Wii so popular, and the X360 too, atleast here in Mexico... they sold like crazy because everyone could have free games and buy them right off the flea market. Maybe... if Wii U gets piratted as the Wii, it could go big and success? @Zodiak13 They are not the same at all. Stealing from a shop causes them to lose the item and selling crack more than likely causes other crime to be committed to get money to buy the crack from you. (Along with massive amounts of misery where the original cocaine is made). It is not as bad as either of those two things particularly the second. @slim80 Loads of Wii's were sold and they only ever had Wii Sports but it was sold at a profit so Nintendo made a profit. The average amount of games sold per system was really low for the Wii. This comment section is very annoying. HACKERS =/= CHEATERS They are only going to use this hack to make custom tracks, music, characters, etc. And this is coming from MrBean35000vr. The same guy that added 200+ tracks to MKW, and is one of the reasons you can still play MKW online. And for those thinking that others will use his work to find ways to cheat online, he doesn't release his mods in a way to allow that. To this day no one else knows how he hacked the menu to make room for 50+ more cups. @rp17 Interesting if he did that then it seems at least he believes he can do it. Mario Kart 8 certainly does need fixing and more interesting tracks. @unrandomsam I don't know how I would feel about this if it wasn't MrBean35000vr. But since it is, I am all for his mods and would love to see CTGP U eventually. I just don't want it to be released too early. I want to see what Nintendo can do in terms of DLC first. This is awesome! I can't wait until this is (if it is) publicly released. Exactly, best case scenario, Wii U gets hacked, sells millions of consoles to hackers, Nintendo waits a month or 2, before the big Christmas releases and sends out a patch that kills the hack but still increases its install base tremendously. The Wii, PS3, and 360 all increased sales dramatically after they were hacked, and this wont be any different. I hope Nintendo patches there work. I'm not the biggest of game mods. Project M was good but I preferred the original brawl. I really don't want anybody to hack the next smash! Thanks for keeping me updated about the homebrew scene, Nintendolife! I'll be sure to purchase a used Wii U once the games are free. And gee, think about it, someone even said it before, the amount of games bought per wii console (meaning, how many games a person with a wii console ended up buying, AKA attach rate i believe) was low, why? cause games were not selling as much, people either didn't buy games or they pirated them, simple! @Smooty Wii actually had a very high attach rate. Like 8.5 or something. Not low at all. So your point doesn't stand. And no, piracy doesn't make a console successful. It sure didn't make it for the Dreamcast, which has got to be the easiest console to hack I've ever encountered. Alot of people, maybe not in the U.S. but countries like Mexico, Brazil, Chile, (pretty much all Latin America) alot of people in these countries can't afford a console and multiple games, SO believe it or not, A LOT of them wait until a console is hackeable/has access to free retail games and when they see they CAN buy the console and expend zero $$$ you know what they do? (or did before) they rush to buy that console or consoles, about %40 of Wii's sold consoles came from people like these, piracy sure does kill software sales, but it boosts hardware sales bigtime.. I hate piracy but this is a real thing, most of you don't believe it cause you live in U.S or UK, but piracy is a big, big thing in my country and others. As someone who recently put the original wii to rest I use devolution on my wii u to allow me to play my legit gamecube collection, least the developers added anti piracy measures to ensure a copy of the game was required. It's silly nintendo hasent enabled this feature yet while homebrewers have made it possible, There are benefits and gamecube games look great on the gamepad too!! @Samurai_Goroh okay, thanks for stating that i said that cause someone else said it and i thought it was true. Piracy doesn't make a console succesfull thats obvious, but it does make a good boosts in sales, a big one. I don't think this is too much to worry about, changing a little bit of text and music is still only about 0.0001% of what would be needed to be done for full tracks etc. These guys are just still learning and it's a exciting time for them, I just hope they stay on the path of ''no cheating'' and I hope they don't accidently open up any back doors to hackers to totally trash the online side of things. I only tend to bother with hacking my systems when they are no longer supported by the original companies. Hense, I have a PSP, Wii and NDSLite with homebrew enabled CFW. I might try to hack my PS3 once Sony stops updating the firmware as that is always my first check before going ahead. It took me nearly two years to figure out Wii wasn't going to go beyond 4.3U. @Link506 @Kewlan True, they could have faked it... But these guys have a reputation. They were the sole reason that people could add over 200 tracks to Mario Kart Wii, and countless extra music, textures, etc. On addition, they are one of the reasons people can still play MKW online, with the Wiimmfi server project. That's why I don't believe they faked this. They have modest intentions, but there will be other people who use their homebrew method for piracy. Nintendo will lose support from its trusted third-party and indy developers, and the Wii U will be doomed... unless Nintendo can patch this out. @Zyph It wouldn't have to be this way if, you know, more devs endorsed mods and provided legal mod tools? All that energy spent hacking would be spent on making awesome new content. Fact of the matter remains: whether they intention is good or bad, these 'mods' open the door for malicious 'hackers' and pirates. I say it like this because most of the truly malicious hackers aren't making money doing anything else or aren't great hackers themselves. They mess things up and often because someone pays them to do so. Killing the industry with (almost necessary) DRM due to increased piracy? Nintendo should be making games, not worrying about having to patch their system's infastructure. The only hack i would be interested in is Gamecube backwards compatability. @PLATINUM7 Don't think it is being sold at a loss any more. Everyone saying ''Patch this out''.. in a way already is, they are not on the latest firmware, and if they did try to update it would likely kill the system. It might even be close to impossible to get a WiiU with a old enough firmware to even use this guys method rendering everything done so far a complete waste. This seems like a big waste of time and effort, but whatever. Anything that leads to potential interference with online play for others should definitely be stamped out, though. @SneakyStyle My Mario Kart one came on a stupidly low one. (To the point where I couldn't link my NNID without loads of messing around. @Noelemahc but nintendo doesn't want to degrade their IPs into something like TF2. Even the half life franchise can never regain full respect after being in Garry's Mod. @PvtOttobot Not the point I was making. Let people freely change the palettes of drivers, build custom tracks, tweak the race rules in Mario Kart. Even this smallish step - which constitutes 90% of mods made for MK on the Wii - will go a long way. I know hackers don't necessarily equal cheaters, and I'm glad that this guy is learning a way to mess with font, text and music, but in a way it does concern me that this will eventually turn into a backdoor way to cheat and hack through a game like we saw in the Mario Kart Wii days. I flat-out quit playing that because of cheating hackers. And the only reason it concerns me, despite their promises, is because if you look at this guy's other videos you can see examples of all the hacking and cheating he did in MKWii. He can make all the promsies he wants, but that isn't to say that one day if he finds a way to exploit MK8 any further like that he won't ever do so. Me personally, I think MK8's fine the way it is. Custom tracks are one thing--if actual battle arenas were created that would rule--but I don't see a necessity in changing course names or the music. Developers spent a lot of time and money to make the game how it is today, why mess it up with terrible-sounding music and immature names? Those are my two cents, anyway. I would NEVER EVER cheat online. Hmm, I think there's room for them to create a modding system that would prevent piracy, at least until some pirates possibly exploit these guys' work. They said they were only interested in game mods, if they don't make a homebrew launcher, or otherwise reveal a way to run any little bit of code on the system unfiltered, they should be fine. If they just make a program that installs a patcher on a Wii U, specifically for modding games and some little OS stuff (like the text font), pirates won't immediately be able to rip and run pirated games. Unfortunately there's always the possibility that their code can be reverse engineered. Cheating might be a little trickier to prevent, since cheats are essentially mods. Could they possibly force all code changes to be only client side and make online games merely desync? Eh, I can't say I actually know how that works, and that would only be useful if the server automatically disconnects if a game gets too synchronized, which I'm not sure about either. I would like it if this project came through, as long as some good mods came out of it. Custom Mario Kart tracks, 3D World levels, Smash Bros. stages and characters.... On the other hand, though, if this gets released to the public it could potentially lead to further modding, if other people reverse engineer their methods. Piracy would be brutal to Nintendo this gen, considering they are selling consoles at a loss, hoping to turn a profit with game sales. On the other hand, Nintendo's also been very good with patching exploits this gen, so hopefully they'll step in if things get out of hand, and no sooner.